The Marikina River today. Photo issued by the Marikina Public Information Office. More than 54,000 people have been moved to safer ground as Metro Manila and nearby provinces are hit by heavy rain and flooding. Social media is awash with calls for help as tropical storm Karding (international name Yagi) triggered floods reminiscent of Typhoon Ketsana, which killed hundreds of people in the capital city in 2009. Marikina City has implemented forced evacuations affecting at least 21,000 people after its river reached critical level today (Sunday, August 12). In nearby Rizal province, 19,000 people have been moved to safety. “The water level continues to rise,” Mayor Marcelino Teodoro told DZBB radio yesterday evening, again likening the flooding to Typhoon Ketsana. Families were on rooftops in Marikina waiting for rescue, according to Twitter posts of people seeking help. Across Metro Manila, more than 9,000 people have been evacuated in Quezon City, Valenzuela, Manila, Malabon and Pasig. 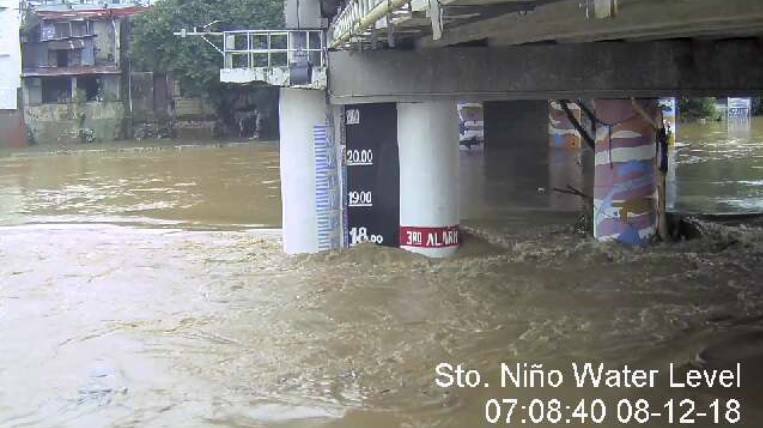 Floodwaters in some areas are chest high, rendering roads impassable, according to the Metropolitan Manila Development Authority. Gates of several dams have been opened, the weather bureau Pagasa has said. Train services have been halted and schools closed. In Cavite province near Manila, a bridge used as a shortcut to the tourist destination of Tagaytay City has collapsed, ABS-CBN News reported yesterday. A tropical storm and another weather disturbance outside the country are enhancing the southwest monsoon, bringing widespread rain over the main Luzon island including Metro Manila. The rain will continue until Monday, Pagasa has warned. The Philippines, among the world’s most disaster-prone countries, experiences an average of 20 cyclones a year. In September 2009, tropical storm Ketsana delivered more than a month’s worth of rainfall on the capital region in a day, the most in more than 40 years. More than 4.9 million people were affected by the storm, which killed at least 462 people and caused 11 billion pesos of damage to infrastructure.